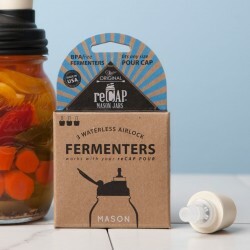 Preserve your food the natural way with the Wide Mouth Ball Mason Fermenting Jar Lid. Fermenting food is the oldest form of preserving with the technique being in use for over 4000 years! Yes you can make Pickles, Kimchi and Sauerkraut, and that is just the start. Ferment all your veggies and fruits into delicious foods which are much better for your health! 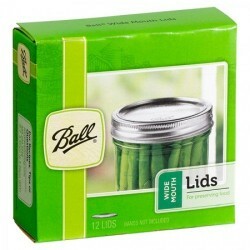 Ball Mason reusable Lids are of the highest quality and contain NO BPA! (Bisphenol A). The lid effectively provides an airlock, allowing gases to vent naturally from your jar without your intervention, which can introduce harmful yeasts or excessive oxygen to the fermenting product. The lid will fit any Ball Mason wide mouth jar. You will receive the lid with airlock. Please note. 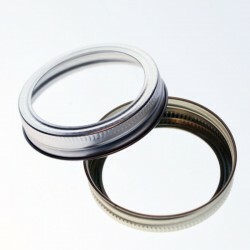 With all Wide mouth fermenting Ball Mason lids, the only dunking weight that will fit inside is a SMALL. No dunking weight will fit in a regular Ball Mason jar. Place the lid with the airlock inserted on top of the jar by screwing firmly. 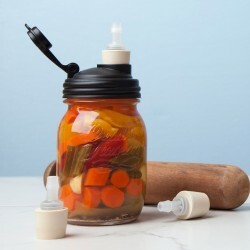 Once the product is fermented, you can store it in the fridge with the air lock in situ, or remove the lid and replace with a storage lid such as the Ball Wide Mouth storage lid.